Music plays an important role in our productions by linking the different plays and in contributing to the emotional power of the performances. Most often this has been Early Music (see Richard Still’s piece below) but everything from folk to electronic music, from hymns and carols to rock, have featured in our shows over the years. The following is taken from the programme for our Millennium performances and was written by Richard Still who was Musical Director from 1994 to 2000. We know that music was used during the medieval performances of Mystery Plays – there are musical directions in the original manuscripts and at one point Herod calls “You musicians of mirth, now blow up a good blast”. Engravings, woodcuts and paintings of the time show musicians as a part of theatrical productions. What music was used is more of a problem. The only piece of music which is known for certain to be associated with medieval biblical plays such as these is the ” Te Deum” – a hymn of praise – which the Lincoln productions use as a part of the background music. The music used in the earliest medieval performances would have been selected from melodies already in existence and known to the audiences, i.e. earlier than the date of 1450 when the plays were written. Keith Ramsay suggests that the plays were performed on and off in Lincoln up to about 1565. This gives us a period of over a century when the plays were being presented. For the modern revival of the plays, the music has been chosen to include all of the styles and musical techniques which might have been heard throughout the plays’ first span of production. This is not a reproduction of one specific, imaginary, medieval performance but a distillation of all the possible ways of adding music to these plays, drawing on music from the 12th to the 16th centuries. The instruments used, also fit with this period of history. People are probably most familiar with the recorder — not the instrument so beloved of parents of six-year-old budding musicians – but a whole range of lovely, mellow sounding woodwind instruments. We also use the curved crumhorns, wooden renaissance flute, psaltery, rauschpfeife and lots of percussion. 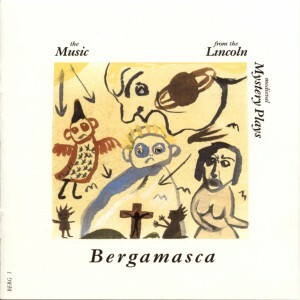 The musicians of the Mystery Plays Company are based on the Lincoln early music group, Bergamasca. 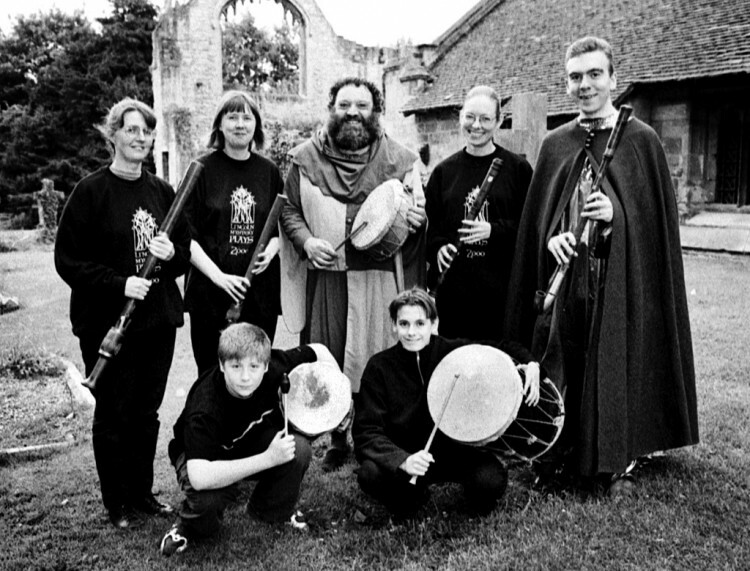 This is a group of musicians who share an interest in the music of the middle ages and the renaissance, coinciding very well with the period over which the Mystery Plays were first being performed in Lincoln. The members of Bergamasca are supported by further instrumentalists and singers during this production. Members of Bergamasca are; Christine Hasman, Helen Mason, Richard Still, Jane Stubbs and Jane Ward. During the 2000 production, we are supported by Richard Lindsay and the actors, Ba Wheeler, Mekala Mahalingham, Cassie Ulph and Katie Greathead. Bergamasca’s CD was released to co-incide with the 2000 production.